It’s not often that a hit British product is launched in Tokyo shops before it makes its domestic debut on UK shelves. 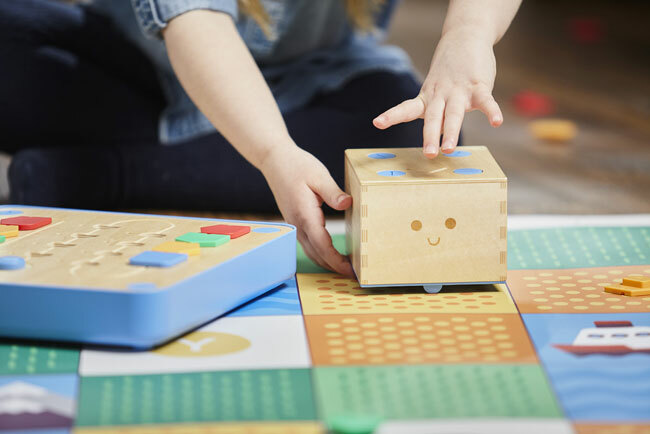 Yet in February at Isetan department store in Shinjuku, Tokyo, that is what happened.The Cubetto play set, a ground-breaking new computer programming toy designed, built and sold by London-based Primo Toys, was launched online in the UK in November 2016. It has since been snapped up by more than 20,000 nurseries, playgroups and after-school coding clubs from Aberdeen to Australia. With a little help from Silicon Valley investors, including Mark Zuckerberg’s sister Randi, the former head of marketing at Facebook and now a campaigner for child-friendly technology, Yacob prepared to launch an improved version of Cubetto, again using crowdfunding. The second campaign, in March 2016, raised $1.6 million (£1.1 million), the highest-ever for an educational project in Kickstarter’s history. Cubetto’s various next manifestations are already in “advanced development”, said Yacob. “We have more logic blocks, more maps, more stories, more adventures. Cubetto is going to visit a bunch of places, from jungles to caves to docklands to factories. Next year, he’s going to get a new friend, and they will go travelling together. We also want to explore topics like phonics and musical composition”.The company now employs 16 staff at its London headquarters and operates in 96 countries. In manufacturing facilities in Shenzhen, China, 42 people build Cubettos as their full-time job. Primo is opening offices in South Korea, where they already have four staff members, “and we’re moving that way as well in Japan”. I don't get this. If a kid starts using this toy, by the time she enters the job market, let's say in 10 years, coding is all going to be performed by AI. Technology is moving so fast that you really can't plan for it anymore, especially 10 years in advance. I think that the best thing you can do is to make sure the kid has not only a good handle on math and science, but also excellent language skills. The rest is a crap shoot. I guess the attraction of this is that it gets kids to do programming without looking at a display screen. So the 30,000 yen price tag can be seen as an acceptable trade off for that benefit. It might be the key point in selling to parents and preschools. 30,000 would of course easily get you a tablet, notebook, or some Raspberry Pi/display combination that would run Scratch, MIT's other, far more complex yet intuitive coding language developed for kids. Kids can do far more creative things in Scratch than with this robot, such as 8-bit era level games with whatever sprites they can make or find somewhere. The kids will have to look at a screen though, which some people seem to think is a universal bad. All programming languages are build on the same principles of logical thought, so that skill will never be obsolete. especially if it is done without a screen. But there have always been toys and tools for engendering logical thought. Jigsaw puzzles and blackjack come to mind. Regarding screens and things, there are three aspects of digital literacy: operating a program, making a program, and making/maintaining the hardware. The first two are now down. It is just that last one that almost everybody does not want to think about - because it is too damn difficult. For instance, Cubetto is one thing, but could you make an iPad if you had to.